No. 6 Texans host No. 24 Azusa Pacific in program’s first NCAA-era playoff home game Saturday. Photo courtesy by The Flash Today. The Tarleton State University Texans came into the game as the projected winner, and the predictions were right as they demolished their opponent The Azusa Pacific University Cougars 58-0 on Saturday, Nov. 17. The Texans playing on their home field looked at ease during pre-game routine, this continued in to the game itself as on the first possession Quarterback Ben Holmes completed a 28-yard pass to J.F. Thomas for the first score of the game. On their next drive, All-Conference running back Xavier Turner pounded the ball for an accumulative 44 yards for his first touchdown of the game. The Texans defense was stout during the first quarter not allowing the Cougars quarterback to get comfortable and forced him out of the pocket on multiple occasions. The last score of the quarter was a field goal by the Texans that made the score 16-0. Less than five seconds into the second quarter the Tarleton defense had caused and recovered a fumble, followed by a touchdown by Turner later in the drive. Ben Holmes had another aerial touchdown this time connecting to Zimari Manning for 22 yards. Texans kickoff team recovered an onside kick halfway through the period. The Texans defense continued to dominate during the time by not allowing the other team to gain any momentum toward the endzone. The quarter ended with the score 37-0. Coming out from halftime, the Texans were looking to leave the game early by running the clock as much as possible. However, they scored on a second touchdown connection between Manning and Holmes this time for 36 yards. Turner’s last touchdown came during the third with a stunning 61-yard rush blazing through his opponents. The last score came from Senior Adam Berryman as he punched in the ball in on the goal line. The final score of this first round playoff game was 58-0. Multiple players on the offensive side of the ball stood out during the game. Ben Holmes had 76 percent completion rate with 224 yards and three touchdowns. Xavier Turner is the first Texan to ever rush for over 200 yards in a playoff game, in addition to his three endzone trips. 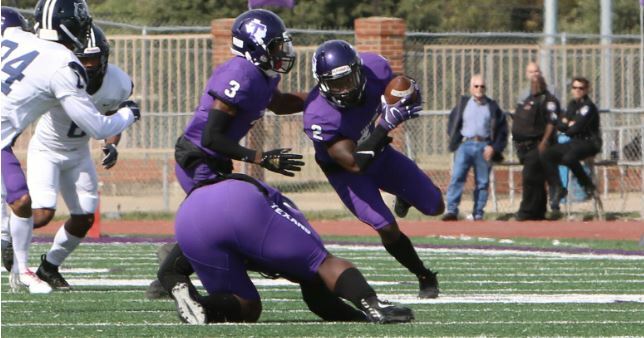 The dominant Tarleton defense was led by Prince Robinson with eight total tackles, a forced fumble and an interception. Followed by Ronnell Wilson with six tackles and E.J. Speed with five tackles and a sack. Special teams proved especially dangerous. The Texans recovered an onside kick as well as recording an 84-yard punt return by Ron Reid. 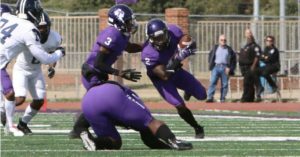 The historic team from Tarleton State University advances farther into the depths of the NCAA DII Playoffs with their next opponent being LSC rival Texas A&M Commerce. Earlier in the season the Texans beat the Lions during the interconference battle 47-21. However, it should be an enticing game to watch as last year Texas A&M Commerce were in a similar situation and pulled out a national championship. The game will be held in Stephenville, Texas at Memorial Stadium at 1:00 p.m. on Nov. 24.